If you are searching online for airports or airlines that offer fear of flying classes, chances are you’ve found out that no such courses exist, either in person or online. However…. IF you live in or can travel to the Phoenix or Los Angeles area, you are in luck! Whether it is getting to the airport, going through security, waiting at the gate, takeoff, turbulence or sweating it out at 36,000 feet — our classes are designed to help you to recognize, regulate and replace your triggers and mental dialogue that keeps you stuck in a vicious anxiety loop. Flying doesn’t have be painful. Once you have experienced one of our classes, you will not only know that the pain in your brain is not about the plane, but you will have gained the confidence that air travel-and the planes-are completely safe. Much more importantly to you however, you will also have cultivated the confidence and skills that you can manage yourself and your anxiety in ways you never thought possible! Afraid to fly? You are not alone! Learn about the Proven FearlessFlight® Method! Many thousands of fearful flyers like you have attended the Cleared for Takeoff Classes over the last 31+ years. This class offers a roadmap for you and introduces you to the tried and true FearlessFlight® Method. The first part takes place in a classroom inside Terminal 4.The second part of the class takes place on a Southwest Airlines airplane parked at a gate, where students will also receive a tour in and around the aircraft. Are you ready to take that first step? Change the Way You Think about Flying! 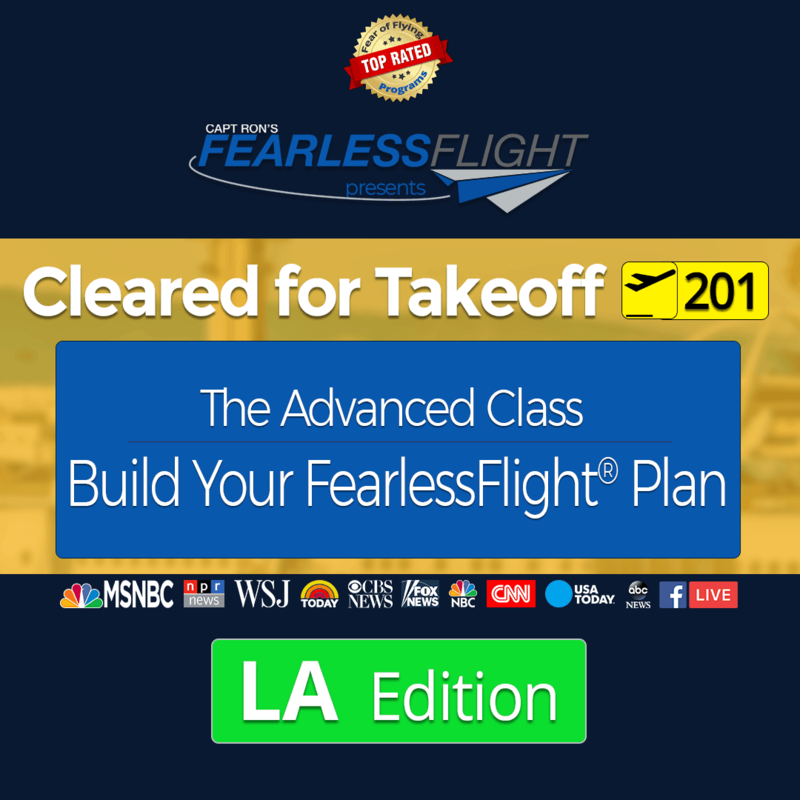 Build Your Personal FearlessFlight® Plan NOW! You need a proven system so that you can finally build YOUR Personal FearlessFlight® Plan! 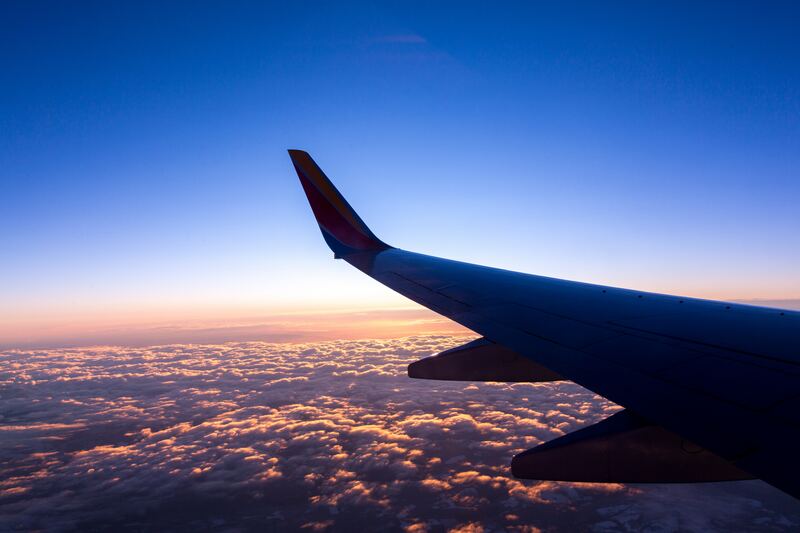 In this class, we have broken down exactly what you need to learn about and apply, if you are serious about overcoming your fear of flying, into a simple Step-by-Step Process. After completion of this class, you will be ready for the final (optional) step, which is apply what you learned in the Cleared for Takeoff 301 – The Flight Class! 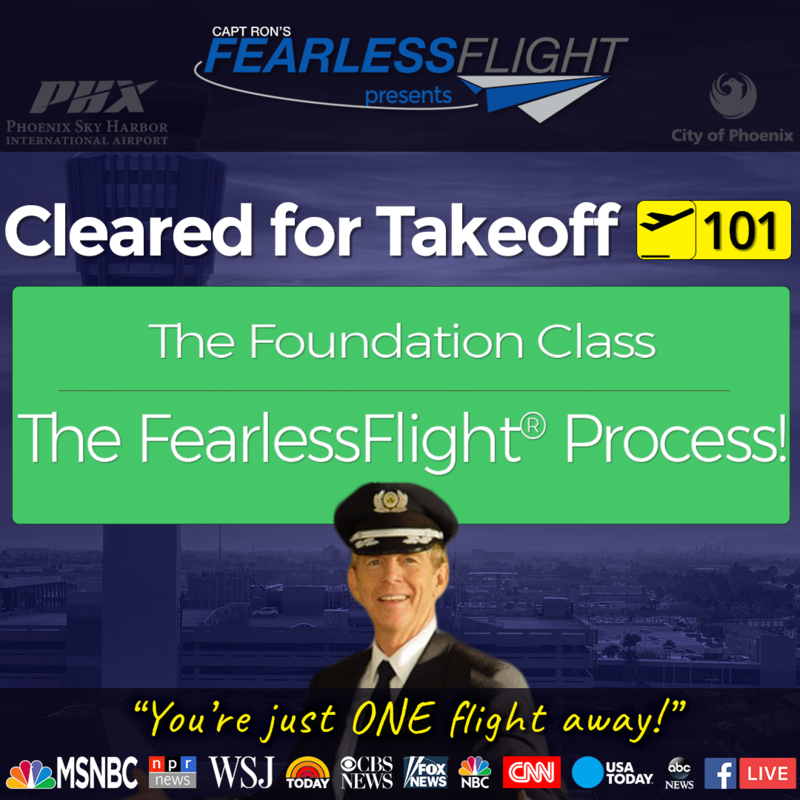 CFT 301: Put Your FearlessFlight® Plan into Action! Get outta your chair & into the air! This Flight Class is designed as a practical next step to follow the Cleared for Takeoff 201 classes. Finally be able to get on a plane and learn how to master your fears through live, professional coaching, social support in a safe atmosphere created by Capt Ron and his team. Together with other like-minded fearful flyers powerful and lasting positive experiences and memories are formed that will serve you well, when it’s your time to fly by yourself, with work colleagues or family. 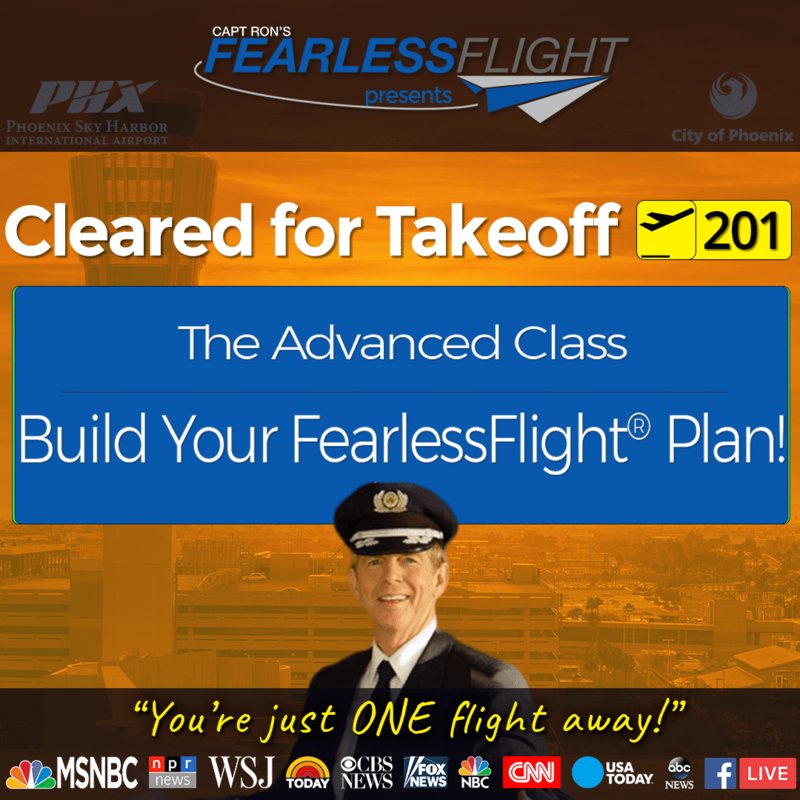 CFT 201: FearlessFlight® and Air Hollywood = The most powerful Fear of Flying Class in the world! Next Class: Tentatively scheduled for Fall 2019. Stay tuned for updates! 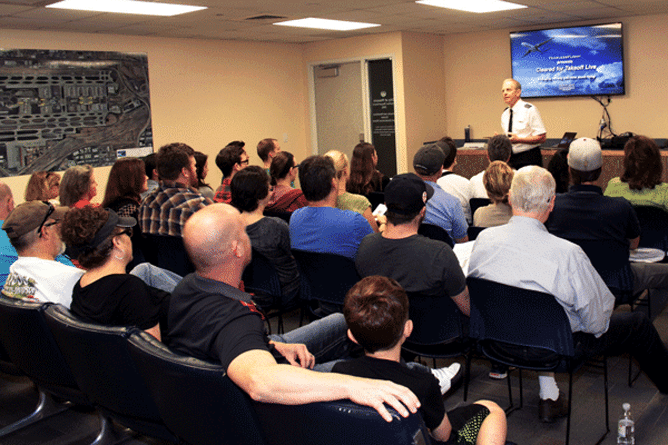 The ONLY class in the Los Angeles area that will teach you how to overcome YOUR fear of flying! This one-of-a-kind class features a four-hour immersive curriculum, starting in a faux airport terminal, TSA checkpoint, departure lounge, jetway, and ultimately a flight onboard Air Hollywood’s turbulence-generating airplane mockup. This state-of-the-art interactive classroom offers students a safe and friendly environment in which to practice and progressively build confidence. All our classes are based on our FearlessFlight Method®, a detailed and easy to understand framework and curriculum that we have developed for you. It is based directly on what we have distilled and refined in over 31+ years teaching fearful flyers like you, successfully overcoming their fear of flying. Like and follow our Facebook page to get notifications when Capt Ron does live talks on Facebook to answer the most asked questions about flying. After sixteen years of living in fear, Gordon thought he tried everything – until he came to class! Gordon hadn’t flown in over 16 years. It wasn’t onlyhis anxiety about flying. He had developed a generalized anxiety following a surgery over 20 years before. But meeting the woman who would become his fiancée and a surprise trip she had planned for the two of them that sense of urgency to overcome his fear. Three weeks before his London vacation, Gordon called me. He came to class and began using the FearlessFlightTM Kit (FFK). He thought he had tried everything, but what he really needed was to let go and teach his mind to relax. He practiced with the FearlessFlightTM Harmonizer (one of the components included in the FFK). He noticed changes in his behavior. He began to feel more relaxed. He wasn’t obsessing about the trip to London as much. And when those obsessive thoughts would come up, he had a process which he could use that turned the anxiety around. It wasn’t like the anxiety had disappeared. About a week before the flight to London, he noticed his anxiety stating to climb again. He was a little queasy and his heart would race. So, he doubled down on the FearlessFlightTM Harmonizer. Because the flight had such significance, Gordon decided to take a practice flight. Time was critical and he couldn’t wait for our next Cleared for Takeoff 201, The Advanced Class. Gordon used the FearlessFlightTM Harmonizer in the boarding area before the flight. He continued listening through the boarding process except for the time he took to meet the pilots (a very important strategy that we discuss in class). He took his seat, got settled in and resumed using the Harmonizer. As the flight attendants began their final preparations, they announced, “Please turn off all portable electronic devices” (a requirement that no longer exists). Gordon felt a small spike of anxiety. “Will I be able to handle the takeoff without the Harmonizer?” he wondered. As the pilots turned onto the runway, instead of his mind’s eye autopilot switching on and starting a flood of anxious thoughts in his consciousness, something strange happened to Gordon. He was now able to visualize the display from the FearlessFlight Harmonizer and immediately place his mind in a relaxed state—something that was impossible just weeks before. Gordon could now focus his attention on what HE wanted to think about. This was the first time he could remember having this kind of freedom and confidence—an entirely different experience in an airplane. Gordon went on to complete his romantic getaway with his fiancée. He flew 10 flights in 19 days. He found challenges on every flight, but he met every challenge with growing confidence following the regimen he learned at the Cleared for Takeoff 101 Class. In fact, his biggest challenge resulted in a bonus flight on this extraordinary adventure. The final leg of his trip was supposed to be his flight home from Charlotte, NC, to Phoenix, AZ. Shortly after leveling off after the climb out, he heard a muffled popping noise. Shortly thereafter, the captain came on the loudspeaker and announced that one of the engines was “under performing” and that they were returning to Charlotte. They landed uneventfully with the fire trucks and emergency equipment standing by. Gordon confessed that while this was not on his bucket list, it wasn’t the confirming catastrophe from which he might resolve to never fly again. Just the opposite. 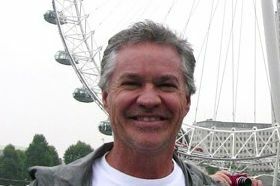 Gordon said that had he not come to class and learned about new coping tools and strategies including the FearlessFlightTM Kit, he would have NEVER gotten back on an airplane to complete his planned travel. Instead of being a victim to catastrophic thinking, Gordon recalled his first response was his mind saying, “Just breathe.” With that, he could control what was in his power and leave the flying to the flight crew. Gordon has since made several more flights including another international trip. He looks forward to flying—enjoying the confidence that he can use the resources he gained through his experiences with FearlessFlightTM.